Never heard of Zumbrota, Minnesota? Neither had we until we picked up Zumbrota Drivetrain’s line of remanufactured light duty truck manual transmissions and transfer cases. In case you ever want to visit, Zumbrota is south of Minneapolis on Route 52, hard by the Zumbro River. With geography class dispensed with, let’s talk about Zumbrota’s drivetrain components. Zumbrota uses a state-of-the-art hydro-blasting and rinsing process to bring back the OEM finish to transmission housings and transfer cases. All common wear components like seals, bearings, viscous couplers (when applicable), etc. are replaced with new, high quality components. Zumbrota conducts about a zillion inspections during the rebuilding process. In fact, no transmission or transfer case goes out the door until a member of its rebuild team signs off that it meets all of Zumbrota’s quality standards. To make sure your unit arrives safely, Zumbrota packs it in a high-density plastic tote to help eliminate in-transit damage. All Zumbrota remanufactured transmissions and transfer cases are covered by a two year/unlimited mileage limited warranty. 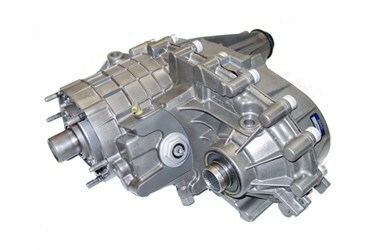 Zumbrota remanufactures five- and six-speed manual transmissions for GM, Ford, Dodge, and Jeep vehicles. All internal parts are inspected—gears are checked for wear, main shafts for straightness, and synchronizers for proper function—and replaced if necessary. Summit Racing offers Zumbrota remanufactured transfer cases from names like Borg Warner, New Process, New Venture, ATC, and Magna Powertrain (MP) for domestic and import four-wheel drive and all-wheel drive vehicles.